August has been my least active month so far, and I intend for it to be the only one of its kind. I started off strong, but then essentially dropped to zero activity when I found out that I got the job in California. There's an entire week in my log of blank spaces! Some of the days off were excuseable - I had two days to pack everything I could into a pickup truck, and then we had to drive for three days straight. There was unpacking to do once we got here, then errands to run as I started to set up my life for myself. The exercise routines I was in back in Chicago were great, but this is certainly not Chicago and I needed to figure out what my new routines would be. As for the Chicago half of my month, I ran 24.7 miles - including an 8 and a 9 mile run as I prepared for next week's half marathon that I will not be running anymore. I used the Wii Fit once, for 41 minutes, and burned 217 calories. And I used the elliptical four times, for a total of 3300 calories burned. In California, I ran just under 8 miles - a 3 mile run on the streets, a 1.5 mile run on the complex's lousy treadmill, and then the 3.4 mile 5k. I biked an awful lot - 92.5 miles, which is a lot considering I got my bike on the 26th. I had done 1.5 miles on the complex's lousy stationary bike (it's just a lousy little gym all around), then biked at least 10 miles everyday after getting my own bike. As far as September, I'm not sure what my exercise goals are. My complex has a couple of pools, but I'm mostly using them to float and cool off (I'm still not quite sure how to properly swim and don't want to risk another injury like the beginning of July). I don't have a TV just yet and likely won't have one until I get paid in October, so Wii Fit is out of the question. I'd like to get back into running more, but I don't have any distance or speed goals. I've researched half marathons in California, and there are tons between now and the end of the year, so a half in 2011 is not completely off the table. I just don't have anything scheduled yet. I will be biking at least 40 miles a week, since my commute to work is 5 miles each way. That doesn't even count exploring or running errands! Which brings me to my favorite calorie burner - the elliptical. 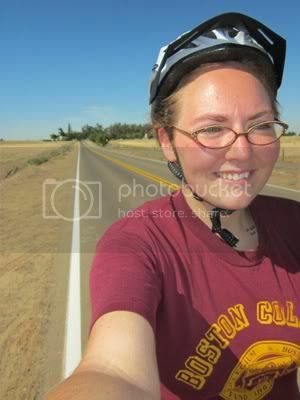 Or at least, my former favorite - I'm really loving biking these days. I thought about joining the university gym like I did back in Chicago, but even though the facility is great and the cost is the same as the one I used to use, the university is *very* small and I'd see my students there, for sure. Not that it's a big issue, but I'd rather not see them in that environment if I can help it. At my old school, there were two gyms, and I used the smaller one on the other part of the campus to avoid any run-ins. So, I'm faced with a choice: should I join an off-campus gym? And right now, I'm leaning towards no. As I start preparing myself for maintenance, I'm doing a lot of thought about my eating and exercise habits. I love working out on the machines at the gym because I see great weight loss results, but when the goal isn't huge losses, I won't need to spend as much time there. I'm trying to focus on running and biking for my losses now, and as I approach maintenance, my goal is simply to maintain a healthy level of activity, but eventually increase my calories to a point where I will balance my in-and-out calories and therefore maintain my weight. There *is* a gym right down the street from me - a woman I met at the 5k race was telling me that she does BodyPump and BodyFlow and all those types of classes there - so it's always an option. But for now, I'm going to give this a try and see how it works. What about you? How was your August? What are your goals for September? For maintainers: please feel free to critique my shift-in-exercise-goals plan - I think it will be a good fit for me long-term, but I always appreciate your thoughts and advice! I love that you're going to be biking. I wish I had a bike. It looks like so much fun...and I remember it as much from my childhood. I love how far that you have come and your determination. I would not break your gym habit. Holy Cow Mary! I get a few weeks behind on my blog-reading and when I check back in you have a whole new life! I'm so excited for you in your new adventure, and my heart aches for you having to leave Bobby. I am loving your biking pictures! You know how much I love biking, especially when I feel like I am doing it for function (to get somewhere I would be going anyway) rather than just for exercise. I think your shift in exercise goal plans sound totally reasonable and healthy. Unlike me, where I tend to go through phases of fanatical exercise then morose inactivity. Like now. But then I get started again and it slowly builds back up to "excessercising" until I crash and burn again. I guess that's my maintenance plan, haha. I do have to say that I love Bodypump and Bodyflow, so if it were me I would join the gym. But if I could do moderation for one second I would go your route. I'm tempted to put this in all caps, because I want to shout, but I can't believe you were going to propose marriage!!! I think you made the right decision to back off on that. I know it's hard to be apart, but if it's meant to be then you two will come back together. He sounds great. Jeez for an off month you sure achieved a lot! I've had an incredibly bad month diet and exercise wise so September is a month in which I want to make a significant loss. I think I worked out more in August than ever before. My goal for September is to work out a total of 1,000 minutes. I reached 991 last month so I think it would be doable.